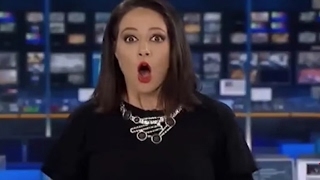 It is a story for our age: an Australian newsreader caught off guard by the end of a prerecorded report. When the camera returns to her she is busy contemplating her pen with gormless intensity. She suddenly realises she is on air, and takes on the expression of a cartoon character who’s just seen a ghost: her eyes bug, her mouth forms a perfect O, and her sharp intake of breath is audible. Then she recovers, reads the next link, and smiles. It’s a story for our age because, as you can see from that summary, it’s not really a story at all. Except the clip went viral. The result is a fairly highbrow example of the “newsreader fail” subgenre, in that no one vomits, but it’s funny. There were reports that the newsreader, Natasha Exelby, had been “benched” by news channel ABC24 for her gaffe. A Twitter backlash followed: Russell Crowe called itan “over reaction [sic] to an over reaction [sic]”. ABC’s first official statement was not exactly a heartfelt show of support: “Natasha Exelby is a casual contributor, not a staff member.” By then other newsreaders had confessed to their own embarrassing moments – corpsing on air, eating on air, dancing in their seats when the camera was meant to be pointed elsewhere. The overwhelming response was one of solidarity – we’ve all made mistakes we thought might cost us our jobs. ABC finally denied it ever meant to cut Exelby loose, a rival outfit gave her a slot, and now she’s a national hero. Not bad, when you consider the original clip was from last weekend. Our sense of basic etiquette has never kept pace with the viral reach of social media, but we are catching up. We’re slowly learning when to replace scorn with sympathy, and how to judge mistakes that have been amplified out of all proportion. But corporations can still be relied upon for a tin-eared response: abandoning employees over innocent bloopers, standing by them when a passenger is dragged bleeding from a plane. They may never get it. I may never completely get it. In fact, I’ve probably made too much of the whole business. For me one of the greatest advances of our age is the wide and immediate availability of spare parts. Forget duct tape and epoxy resin – if you have a model number, you can have a new refrigerator shelf bracket in 12 hours. I’ve patronised many of these services, to the extent that I now receive about two emails a day – usually purporting to be from an actual person – offering me hot deals on toothbrush chargers and oven knobs. I’m as keen on a bargain as the next person, but my need for spare parts is driven only by breakage or loss, never by desire. I have no use for a £25 voucher that expires in three days. I don’t care if your sale on dishwasher rack replacement wheels ends at midnight. On this front at least, I cannot be tempted. I suppose that expressing solidarity with Exelby ought to require some admission of professional incompetence, even if I still don’t see the funny side myself. I’ve never read the news on TV but about 20 years ago I interviewed a noted broadcaster over the phone for about 30 minutes, only to discover after I’d hung up that the tape on which I recorded our discussion was completely blank. It took me another 30 minutes to work up the nerve to ring her back, confess my mistake and persuade her to do the interview all over again. In hindsight I can see a face-saving third way – I should have rung with a few supplementary questions, and then tried to drag the discussion back over old ground – but at the time owning up to idiocy was my only strategy. I still go red thinking about it. … we’ve got a small favour to ask. More people are reading the Guardian than ever, but far fewer are paying for it. Advertising revenues across the media are falling fast. And unlike many news organisations, we haven’t put up a paywall – we want to keep our journalism as open as we can. So you can see why we need to ask for your help. The Guardian’s independent, investigative journalism takes a lot of time, money and hard work to produce. But we do it because we believe our perspective matters – because it might well be your perspective, too.